Long time readers of the Allen School Online blog know that I have a penchant for covering the strange and life-shortening oddities produced at seemingly regular intervals by the US fast food industry. These items — like KFC’s Double Down and the recently-proven-fatal Triple Bypass Burger at Vegas’ Heart Attack Grill — are major contributors to the heart disease and obesity epidemic that keeps medical offices busy with lots of ailing patients. Well, McDonald’s, not to be outclassed, recently upped the ante with a new culinary abomination. 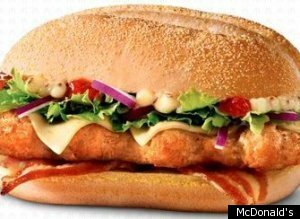 The new McRibster, (that’s a batter fried McRib pork sandwich with bacon) is about to hit markets and arteries near you. The cult classic McRib sandwich wasn’t unhealthy enough I guess, prompting the evil geniuses at McDonald’s test kitchen to think of ways they could make this sandwich even more likely to stop your heart. Have a look at it here and let us know if you think they’ve succeeded.